The Wonders of Life was the last major pavilion to come to EPCOT Center’s Future World when it arrived in 1989. From the gorgeous, spiraling double helix known as the Tower of Life to no less than three marquee attractions on the inside, this was a pavilion where you could spend hours engaged with attractions, dining, and shopping. Some of the smaller attractions could be some of the most fun; I for one never passed up an opportunity to ride through Disneyland on one of the Wondercycles. Today, however, let’s look at Sensory Funhouse, and more specifically the Audio Antics. The Sensory Funhouse section of Wonders of Life included six different components. Each of these areas had been designed for guests to utilize one of their five senses, although there was an emphasis placed on sight, touch, and sound. Pipes that utilized hot and cold features to show you how your sense of touch could be manipulated (Perplexion Pipes), sensory boxes with objects inside where you had to use your sense of touch to figure out what was in the box (Touchy Subjects), balance was tested in a room with a slanted floor (Crooked Room), there were examples of brail where you could take a beginner’s lesson in how to read utilizing brail (Reading Brail), and many a visual riddles (Optical Illusions) were all a part of the Sensory Funhouse. 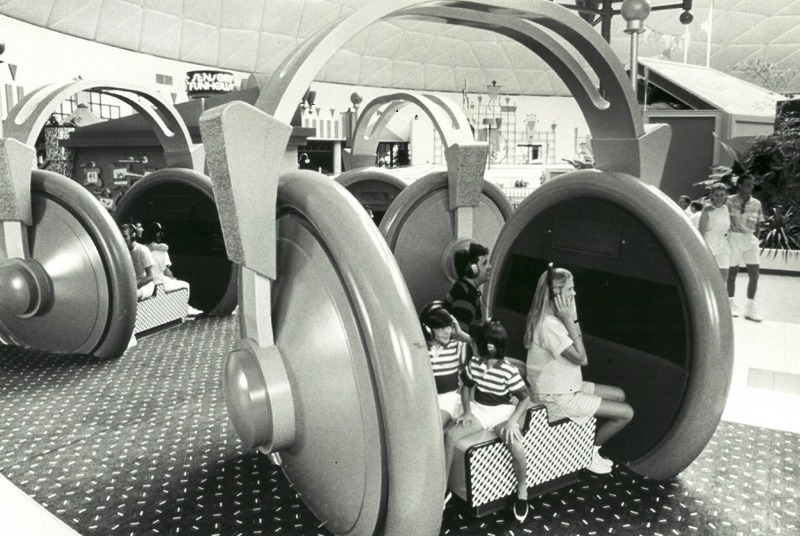 Audio Antics was one of these smaller areas of the overall Sensory Funhouse zone. This area featured oversized headphones with a bench in the middle for guests to sit on. They would then put on their own set of headphones and take part in a guessing game. The trick here was to listen to a sound and guess what it was. Most of the time it was a trick and you would guess wrong, such as the sound of rain falling outside that turned out to be bacon frying in a pan. It was another example of the pavilion showing us how our body could lie to us and how easily we could be tricked by removing a piece of our senses. It was also critical to make sure that the “R” side of the headset was on your right side, as the audio would sometimes move and having he headset on backwards could definitely throw you off. You may not have spent more than a minute or two within the Audio Antics booth, especially after multiple listens, but it was a fun part of the Wonders of Life journey. In fact, the entirety of the Sensory Funhouse section made for a great way to occupy some time if it was raining outside or if children were becoming squirmy from standing in too many lines or if you just loved the idea of messing with your senses. What was your favorite part of the Sensory Funhouse?